This divine combination of fast food you can make yourself at home by following the simple instructions below. In 250 ml of water put two tablespoons of olive oil, a teaspoon of sugar and 20 g of crushed fresh yeast. Leave a few minutes for the water foaming yeast and pour it all into a deep bowl with 200 grams of flour. Mix all in the mixture and gradually add the remaining 250 grams of flour until you get and knead a soft dough. The dough should rise about 60 to 90 minutes in a warm place before further use. During the lifting of dough make homemade beef patties and prepare other foods for stacking cheeseburgers. 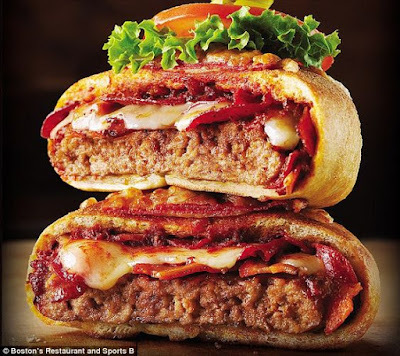 You can buy ready-made burgers and expedite the preparation of pizza cheeseburger. Patties bake on suddenly in the grill pan only to change the color on each side. You do not want to bake them until the end because it will later be dry after baked in the oven. Roll the dough on a centimeter thick and cut it into 2 equal parts. Cheeseburger stack in reverse order because it will reverse before placing in the oven.Take the tomato, pickles, ketchup and mayonnaise. Through them put a hamburger on it a couple of sheets of cheese and then another burger over all. Fold dough over the edges of the patties, and dispose them on baking or far backwards. Each cheeseburger then brush with ketchup, add Milanese salami, cheese and chopped olives. Do not forget them liberally sprinkle oregano. 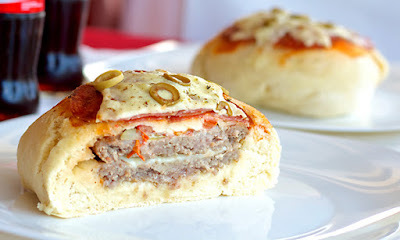 Pizza cheeseburger bake at 200 C degrees for 15-20 minutes. Serve it warm with a cold refreshing drink.